With Secretary of State Kerry’s peace initiative in the Middle East nearing a conclusion, this is a great time to read My Promised Land: The Triumph and Tragedy of Israel by Ari Shavit. If you have already read it, consider reading it again. Shavit is a Sabra, and the son and grandson of Sabras. His British great-grandfather came to Palestine as a tourist in 1897, returned home to fight for the Zionist cause, and ultimately resettled his family in Palestine. Shavit lived through the Six Day War and the Yom Kippur War, and has been a kibbutznik, a soldier, and ultimately, a well-known journalist. Shavit carried out the direction in Genesis 13:17, and traveled the land, beginning in the steps of his great-grandfather. He interviewed both important and ordinary Jews and Palestinians, and visited sites of historic significance in the struggle between the Jews and the Palestinians. In every page of this book, his love for the land comes forth. He asks the question, how did the best of intentions of the early settlers to live side-by-side with the Palestinians, turn into 60 years of confrontation with no apparent solution? The book describes the massacres, the important battles, and the victories and defeats of both sides. Shavit visited locations where Arab villages existed but do not anymore, or have been replaced by Israeli towns and cities. He visited Jewish settlements that have been, and in some instances are still, marauded. He pieced together the reasons that Palestinians departed or were driven away from them. The title, “My Promised Land,” is misleading: After reading the whole book, “Our Promised Land” sounds more appropriate. Along with the victories and wonders Israel has accomplished, the Palestinian claim to a fair shake comes through loud and clear. [F]rom the beginning Zionism skated on thin ice. On the one hand it was a national liberation movement, but on the other it was a colonialist enterprise. It intended to save the lives of one people by the dispossession of another. But after 1967, and then after 1973, all that changed… The self-discipline and historical insight that characterized the nation’s first years began to fade… You were wrong to think that a sovereign state could do in occupied territories what a revolutionary movement can do in an undefined land… Ironically, [occupation] brought back the Palestinians Ben Gurion managed to keep away. After building a detailed history, Shavit examines Israeli society, politics, economics, government, and the competing positions between Israel and the Palestinians of today. the realization that the dysfunctional governments of Israel cannot deal seriously with such crucial challenges as occupation and social disintegration. Through interviews with key political and government figures, Shavit explores each of these five apprehensions, gloves off and no holds barred. For anyone trying to understand where Israel is headed and what might happen there in the future, My Promised Land: The Triumph and Tragedy of Israel is a must-read. On The Jewish Channel, Newt Gingrich characterized the Palestinians as “an invented people”. During yesterday’s ABC Republican Presidential Debate, he was asked to clarify these remarks. Is what I said factually correct? Yes. Is it historically true? Yes. We are in a situation where every day rockets are fired into Israel while the United States — the current administration — tries to pressure the Israelis into a peace process…. Somebody ought to have the courage to tell the truth. These people are terrorists, they teach terrorism in their schools…. It’s fundamentally the time for somebody to have the guts to say enough lying about the Middle East. 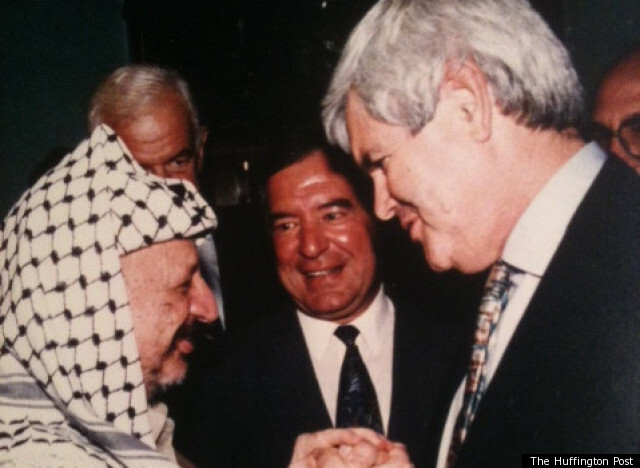 House Minority Whip Newt Gingrich (R-GA) shakes hands with “invented person” Yasser Arafat following the signing of the September 1993 Oslo accords. That’s just stirring up trouble. The Jewish Channel video of Gingrich follows the jump. The Palestinian leadership has announced its intention to abandon the negotiation process and to unilaterally seek a UN resolution that will impose a solution upon Israel. Facing a possible veto in the Security Council, the Palestinians are aiming to impose a UN resolution through the General Assembly “Uniting for Peace” procedure, which they hope will be supported by the UN member states. Such unilateral action outside the negotiation process would constitute a fundamental breach of the 1995 Israeli-Palestinian Interim Agreement, thereby releasing Israel from its reciprocal commitments. Such unilateral action would undermine the international community’s reliance on Security Council Resolutions 242 and 338 which form the foundation of all the agreements between the parties. It would also place into question the integrity and credibility of any Security Council resolutions or agreements resolving conflicts between states. It would render as meaningless the signatures of the major powers as witnesses to previous negotiated agreements. It would also be incompatible with provisions of resolutions and agreements requiring negotiated solutions to the Jerusalem and refugee issues. Alan Baker is former Legal Adviser to Israel’s Foreign Ministry and former Ambassador of Israel to Canada. hostile and cut its diplomatic ties to the bare minimum. The underlying reason for this estrangement is the festering Palestinian question. Egyptians and Turkey hold Israel responsible for refusing to address Palestinian demands that would lead to the creation of a Palestinian state alongside Israel. When the youth in much of the Arab world rose up against their autocratic rulers, little if anything of this had to do with the Palestinians or Israel. Their demands were simple enough. Freedom, democratic rule, and respect for human rights were their clarion call. In the ten months since the uprising in the Arab world, the autocratic rulers in Tunisia, Egypt, Libya, and Yemen have been overthrown. No image is more emblematic of this turn of events than former Egyptian president Hosni Mubarak being tried in a civilian court as he lies on a cot inside a prison cage. Bashar al Assad in Syria is facing increasingly violent opposition from the people that he and his father have oppressed for more than forty years. And he finds himself isolated not only in most of the international world but among sister Arab states. The Arab League, long considered a toothless body, has imposed political and economic sanctions on the Syrian regime. As this swirl of events continues to unfold, the Israeli government has been an increasingly concerned onlooker upon what is happening in Arab countries close to and not a far remove from its borders. The United States, Israelʼs closest ally, and which has long dominated Arab politics by its support of the Mubaraks of the region, has lost much of its clout to shape the radically new political reality that is mapping across the Arab world. The Egyptian revolution is far from complete. The initial euphoria of the revolution that saw the downfall of the hated Mubarak has faded away. Huge crowds have come back to Tahrir Square to protest the continued dominance of the military in the government. Emergency rule remains in effect and thousands have been tried in military tribunals for resisting the security forces. The Supreme Council of the Armed Forces, or SCAF, has taken over control of the country, and its chairman Field Marshal Mohammed Hussein Tantawi, who had been Mubarakʼs Defense Minister for twenty years, is now Egyptʼs de-facto ruler. While SCAF was flexing its muscles, Egyptians went to the polls in the first free parliamentary election in memory in which 62 per cent electorate cast ballots. The outcome in this first round of voting gave the Muslim Brotherhood 40 percent of the vote and the fundamentalist Salafist party Al Nour 23 percent. Liberals and secularists trailed far behind. For Israel this outcome could be a harbinger of a falling out with post-Mubarak Egypt. Mubarak maintained the peace treaty with Israel as a pillar of his foreign policy. To the extent that an elected government reflects popular opinion towards the Jewish state, the treaty could be repudiated or seriously modified. Many Egyptians view Israel with extreme disfavor, as was evident two months ago when a mob attacked the Israeli embassy in Cairo forcing the ambassador and his staff to flee the country. So far the Muslim Brotherhood, the more moderate of the two Islamist factions, has remained quiet in regard to the treaty. It couches Shariah in moderate and ambiguous terms marking a sharp divide with the fundamentalist Al Nour Islamic party. Past Al Nour rhetoric towards Israell has been extremely hostile. So far, there is no indication how SCAF would decide on the treaty, though under the Mubarak regime, the military showed no sign of seeking confrontation with Israel. Jerusalemʼs other main ally, Turkey, has turned its back on Israel and has become a sharp critic of its handling the Palestine issue. Until roughly two years ago the two countries were strategic partners in a wide range of military, economic, and political matters. All that has ended. Ostensibly the rupture was brought about by an attempt by a Turkish non- governmental organization with close ties to Ankara to run a flotilla of vessels to breach Israelʼs blockade of Hamas-ruled Gaza. The Netanyahu government did not take kindly to this action. Israeli marines boarded the lead vessel and in the ensuing struggle, nine Turkish citizens lost their lives. Prime Minister Recip Erdogan, undoubtedly the most popular Turkish leader since Ataturk, demanded an apology for the killing of its citizens. Netanyahu countered by stating the Israeli marines were justified in using force and refused to apologize. An apology, he and his hardline foreign minister Avigdor Lieberman argued, was a strategic asset that had to be preserved. Ironically, Israelʼs military establishment and intelligence community did not view an apology as a prized commodity and urged Netanyahu to offer an apology as a way to soften Turkeyʼs growing enmity; Secretary of State Hillary Clinton quietly called on him to bite the bullet and apologize but he refused. Meantime, Erdogan has dug in his heels and in a tour of Arab and African countries, spared no effort to demonize Israel and champion the Palestinian cause. It would be fanciful to believe that the Turkish prime minister severed his countryʼs strategic ties with Israel over the flotilla affair. Erdogan, an observant Muslim, had long maneuvered to become a leader in the Arab/Muslim world. Keeping the strategic relationship with Jerusalem would doom his ambitions. Under his leadership friendly relations were developed with Iran and close economic and military ties were forged with Syria. On a visit to Cairo, he held his country up as an example of the compatibility between Islamic values and democratic practices. As the Arab Spring brought little comfort to the Palestinian cause, Turkey picked up the cudgels for the Palestinians in the United Nations when Mahmoud Abbas, the president of the Palestine Authority, sought membership in the world organization. The strategy of forming close ties with Arab/Muslim world has suffered setbacks. Relations with Syria have soured as a result of the popular uprising and Assadʼs brutal crackdown on his own people, which according to the U.N., has led to the killing of 5,000 people. Turkey has granted refuge to many Syrians seeking to escape the murderous security forces and has called on Assad to step down. Despite friendship with Iran, the Turks have incurred the ire of the mullahs in Teheran for allowing the United States to set up a radar system on their soil that would detect Iranian missiles fired at Western Europe and Israel. Turkeyʼs system of combining democratic rule with Islamic values has not escaped criticism in Egypt from the conservative elements of the Muslim Brotherhood and fundamentalist Salafists who call for the imposition of shariah law. Despite these setbacks, Erdogan remains wildly popular at home. There is a growing feeling that his policies of turning to the East and not the West are basically correct, particularly given European Unionʼs repeated rejections of Turkish membership. And unlike the E.U. which is lurching from one banking and Euro crisis to another and whose economy is mired in recession, Turkey is enjoying robust economic growth and low unemployment. With economic winds to his back, Erdogan remains committed to his political agenda of courting Arab countries and proclaiming his support for the Palestinian cause. Quiet efforts by the Obama administration to nudge Turkey to reconcile with Israel have come acropper; Erdogan has frozen ties with Jerusalem although much of the overtly harsh criticism of the recent past has been muted. In this sea change in the Turkish/Arab world, Israelʼs right-wing government has lost some of its political footing. It has little or any control over the changes wrought by the Arab Spring. Whatever influence it might have had with Turkey over the flotilla incident it lost because of its refusal to apologize for its action in the flotilla incident. Even if such an apology were forthcoming, it is doubtful that the main lines of Turkish Middle Eastern policy would change. Although is still too early to predict the outcome of the political situation in Egypt in regard to the treaty although it is clear that the two Islamist parties, which have captured 65 per cents of the seats in the first round of parliamentary voting presents an unnerving scenario for Israel. Syriaʼs Arab Spring just might yield some benefits for Israel. It has, for now removed the threat of hostilities with Syriaʼs powerful army which has been preoccupied with putting down the revolt against Assadʼs rule. Perhaps more significantly, it has forced the Hamas political leadership to move its Damascus-based headquarters to Cairo and Doha, the capital of Qatar. This shift to Egypt could moderate Hamasʼs behavior while reducing Teheranʼ ability to threaten clashes with Israel, according to Meir Javedanafar, an Iran expert based in Israel who called the move “a major strategic setback” for Iran. Leaders of the revolt have turned their ire against Hezbollah, Iranʼs proxy in Lebanon, for backing Assad and supporting his goal of crushing the popular uprising. It is indisputable that resolution of the Palestinian question is the sin qua non in achieving for Israel a modicum of reconciliation with Arab countries and Turkey. As of now, negotiations between the Palestine Authority headed by Mahmoud Abbas and the Netanyahu government are at an impasse. Netanyahu has insisted he is prepared to return to the negotiating table without conditions while Abbas has refused to do so as long as Israel continues to promote settlements in the West Bank and build new housing in East Jerusalem. The Israeli Prime Minister is also at odds with President Obama who called for negotiations based on the 1967 borders, a position Netanyahu publicly rejected in his address before the U.S. Congress. While Netanyahu is committed to a two-state solution of the conflict with the Palestinians, his goal is redraw the map of the proposed Palestinian state in a way that is unacceptable to Abbas. In the matter of Jerusalem, he is unalterably committed to the position of a unified Jerusalem under Israeli control. Calls by Hillary Clinton and, in more colorful language by Secretary of Defense Leon Panetta, to return to the negotiating table have gone unanswered. It is highly unlikely that the two sides will return to the negotiating table any time soon. U.S presidential elections have already dimmed the prospects of such an event from happening. The Obama administration has for now forsaken any thought of bringing the two sides together lest he be accused by the Republicans of pressuring Israel to make concessions to the Palestinians. The departure of Dennis Ross, Obamaʼs chief Middle East negotiator, is a clear indication of the administrationʼs quiescent position. Both Democrats and Republicans are positioning themselves on the Israel-Palestine issue to win over Jewish voters and Jewish campaign contributions. The Republican candidates for president have accused Obama of abandoning Israel, or as Mitt Romney has said, “he threw Israel under a bus.” Newt Gingrich has referred to Palestinians as “an invented people.” Netanyahu himself shows no effort to resume negotiations with Abbas. Whenever Abbas takes a political initiative that the prime minister considers anti-Israel such as seeking membership in the U.N. or agreeing to unity talks with Hamas, Netanyahu announces the building of new housing in East Jerusalem which is sure to harden Palestinian attitudes towards a resumption of negotiations. Netanyahu knows that meaningful concessions to Abbas will threaten his grip on power; the hardline nationalists and religious and Haredi parties that are the bedrock of his coalition would almost certainly resign and lead to the collapse of the government. In the face of this situation, Abbas decided to abandon the negotiating track and turn to the United Nations in the hope of gaining membership in the world organization. He also agreed to meet with Hamas in a bid to unify the Palestinian people. The Obama administration firmly opposed both moves. Direct negotiations between the two sides, Washington insisted, was the only way to resolve the conflict. It also opposed negotiations with Hamas, which the U.S. has branded a terrorist organization. Although Abbas succeeded in gaining full membership in the UNESCO, the Security Council, because of U.S. pressure on several council members, failed to support his bid for U.N. membership status. His attempt to achieve reconciliation with Hamas has so far gone nowhere. Lately, negotiations with Hamas have been renewed but, so far, there are no signs of a breakthrough. Furious at these attempts for U.N. membership and talks with Hamas, Israel responded by announcing the construction of new housing in East Jerusalem and withholding customs and tax revenues in the amount of $100 million it is legally obligated to hand over to the Palestine Authority. After a month watching the P.A. cut back salaries to its employees, Israel, under pressure from Washington and the European Union agreed to restore the money. If the renewed talks succeed and Fatah and Hamas form a unity government, Israel has ruled out the possibility of future negotiations on peace talks. Israelʼs deepening isolation in the region has been the subject of attention in Western government circles. Recently, four European countries members of the United Nations Security Council called on Israel to reverse its settlement building plans, saying they were illegal, sent a “devastating message” and threatened the prospects of a two-state solution. The criticism of Israel has come from Britain, France, Germany and Portugal that it has long counted among its closest European allies, pointing up Israelʼs growing diplomatic isolation over the Palestine issue. The settlement policy and housing construction and growing violence against Palestinians in the West Bank have prompted left-leaning Israeli non-governmental organizations to escalate their attacks against the government. These organizations have also called for a boycott of goods produced in the settlements raising the hackles of the nationalist and religious parties. Many of these NGOs receive part of their funding from Western European and American sources. In response to NGO criticisms, the Netanyahu government is considering legislation to limit the amount of foreign financial assistance these organizations may receive. No less insidious is the recently adopted controversial Anti-Boycott law which would make it a civil offence for any individual or group advocating an economic, cultural or academic boycott of Israel or the West Bank settlements. An individual or group advocating such a boycott would be subject to fines and other penalties. Speaking at a closed forum in Washington, D.C., Hillary Clinton warned that such restrictions posed a threat to Israeli democracy. Civil rights activists in Israel as well as international human rights organizations have warned of the baleful effects they could have on the country. Reacting defensively, government ministers have rejected these assertions. Of mounting concern is legislation working its way through the Knesset that would restrict freedom of the press. One of Israelʼs proudest claims is that it boasts the only free press in the Middle East. But journalists and civil rights activists warn this would no longer be true should the proposed media legislation be adopted. On November 20, approximately 500 journalists from different media outlets attended what was billed as an “emergency conference” in Tel Aviv to discuss what they consider unprecedented threats to freedom of the press. The conference protested the lawʼs libel provisions that the journalists say could tie their hands and stymie investigative reporting. The Knesset bill passed its first reading by a vote 42 to 31 the day after the conference. Also of great concern is the growing likelihood that channel 10, famed for its investigative journalism, will be forced to close down at the end of January because a parliamentary committee, at the behest of the prime minister, refused to extend a debt of $11 million to an offical regulatory body. Channel 10 reported on the numerous trips Netanyahu had taken as an elected official to Paris, London and New York before becoming prome minister in 2009. He and his wife flew first class, stayed in baronial hotel suites and, during this travel, lived beyond their means. The bills for this luxury travel were paid for by Netanyahuʼs wealthy friends. The widely viewed report did not make Netanyahu look good in the eyes of the public. Netanyahuʼs refusal to extend Channel 10ʼs debt is seen by observers as his way at getting back at the station. No less a person than Shimon Peres, president of Israel, and a member of Kadima, has weighed in, saying that Channel 10ʼs efforts to survive, is “a struggle for Israelʼs democratic character”. Addressing other controversial actions by the government, he also stated he was “ashamed” of several bills being considered by the Knesset, believing they would infringe on democracy. Ben Caspit, a senior columnist with the daily newspaper Maariv said he sees a “Putinization of Israel”. “I never dreamed that I would see such things”, he said. Bloggers having also been expressing their fury at libel provisions in proposed Israeli law. The law would allow successful libel plaintiffs to win maximum awards of $80,000 even if they cannot prove they suffered actual harm. The sum represents a six-fold increase in the current maximum. In the event the media outlet in question did not offer the plaintiff the opportunity “to add his full response to the publication” the awards can rise to $400,000. The law, if finally adopted, would begin an era of self-censorship and paralyze investigative reporting, according to former Supreme Court justice Dalia Dorner, who is president of the Israel Press Council, the mediaʼs ethical body. Should that happen, the information space in Israel would shrink. Israel has long boasted it is the only democracy in the Middle East. These laws, as they now stand, and the stepped up attacks against the Supreme Court, long a bulwark against legislative encroachments on Israeli society, could make such a boast ring hollow. Israel, to be sure, remains a robust democracy, but these turn of events have already cast a shadow over this bedrock of Israeli society. With the deterioration of relations with Turkey and the uncertainties over the future course of the revolution in Egypt, Israelʼs diplomatic position in the Middle East has dramatically declined. Under the deposed Hosni Mubarak, Egypt had maintained a “cold peace” with the Jewish state and scrupulously adhered to the peace treaty that had been in force between the two countries for the past thirty years. Although the Islamists who won two-thirds of the seats in the newly elected parliament have issued statements promising not to tamper with the treaty, Israel has reason to be concerned that these promises are not commitments. Relations with Turkey, the other anchor of Israelʼs Middle East diplomacy have also suffered as this powerful Muslim state is seeking to become a prime leader in the Arab/Muslim world. In both these countries, the festering Palestine issue remains at the heart of their growing estrangement from Israel. Given the intransigence of the Netanyahu government on the Palestine issue and its refusal to make the kind of concessions that could draw P.A. President Mahmoud Abbas back to the negotiating table, there is little hope that any meaningful progress will made in the near future in cutting this Gordian knot. Britain, France, and Germany, Israelʼs closest European friends, have recently sharpened their criticism of Israeli intransigence, thereby deepening its political isolation. Deterioration in its diplomatic situation has prompted the Netanyahu government to curb speech and press criticism of the settlements The anti-Boycott law would make it a civil offence to advocate an economic, cultural, or academic boycott of the settlements. Proposed legislation regarding the media would raise fines to ruinous heights for newspapers or other media that are convicted of libeling an individual or organization. This legislation now making its way through the Knesset is likely would almost certainly lead to an infringement of the freedom of the press. In an effort to protect the settlements, viewed by most of the world as illegal, the Netanyahu government, is restricting time-honored freedoms within Israel proper. The restrictions have drawn criticism from Secretary of State Hillary Clinton, warning they pose a threat to Israeli democracy. Murray Gordon Silberman served nearly twenty-five years as a senior official in the United Nations Secretariat. Ten years of this time he spent in Vienna. While in the Austrian capital, he served five years as the Vienna correspondent of the Jerusalem Post. After retiring from the United Nations, he worked as a consultant to the American Jewish Committee and was the author of numerous monographs on foreign policy issues. He was also a contributor to the American Jewish Year Book, writing the chapter on Austrian Jewry. Murray Silberman became an ordained rabbi in 2000 after graduating from the Reconstructionist Rabbinical College. He has written numerous articles on the Middle East, Africa and India and is the author of the book Slavery in the Arab World. All his writings appear under the pen name Murray Gordon. Rabbi Silberman currently serves as the Jewish chaplain to the Children’s Hospital of Philadelphia and two nursing homes.